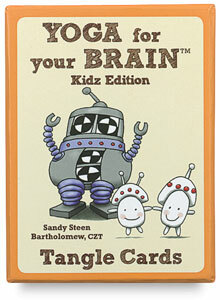 Tangle any time, any place with these Zentangle cards in your pocket or purse! Printed on artist- quality paper, they're handsomely packaged in a handy case for doodlers on the go. The Original Edition, Totally Tangled Edition, and Kidz Edition each contain 40 cards. Pre-printed tiles on the front provide a place to tangle, guided by easy-to-follow instructions on the back. Nine bonus cards are also included that introduce basic Zentangle methods — flip them over to assemble a mind-bending puzzle! When you're ready to freestyle, go with the Set of 20 Blank Cards, each with a blank tile on the front and space on the back to record your personal tangle techniques. ® Zentangle is a registered trademark. ™ Yoga for Your Brain is a trademark.